Wild carnivorous plants grow in most parts of the globe. Some grow in swamps, others in mountains, and some in the trees of the rainforest. There are more than 400 species of carnivorous plants. Here in Denmark we usually see 8-10 species, such as Sarracenia, Dionea, Nepenthes and Drosera. In their natural environment the plants can grow quite large; the trumpet pitchers of Sarracenia can for example grow up to 75 cm tall! Carnivorous plants must be kept in moist soil, and most of them prefer a bright spot. The plants can tolerate temperatures down to -15 °C and up to +40 °C, but remember to water them, as it is very important that they do not dry out. In the wild they trap many insects, but if they are in places where there are few insects, it may be a good idea to give them a little fertiliser. Carnivorous plants will typically bloom after 5-12 months. 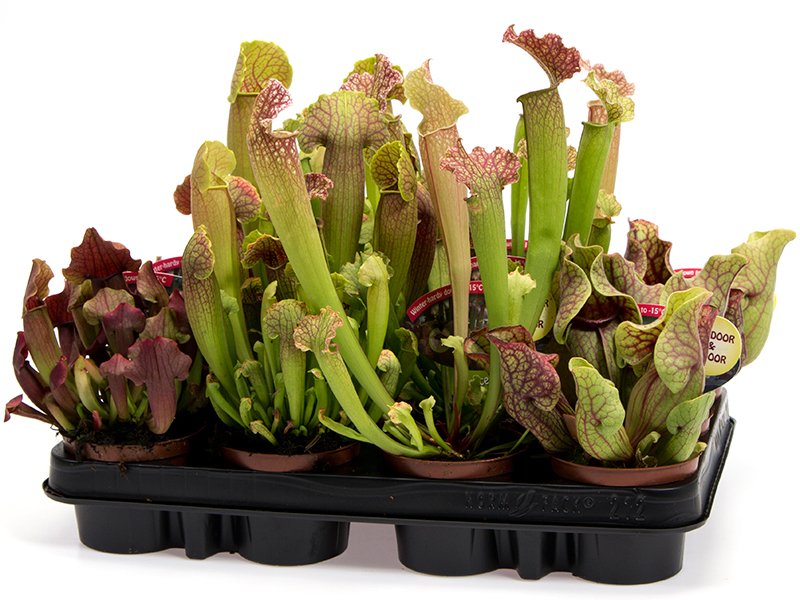 Sarracenia is ideal for planting out, for example in pots, bog gardens, etc. If you plant them out, you will see how the plant’s colour changes with the seasons. You will also be able to see how the carnivorous plant catches insects – a fascinating sight. Gartneriet Lammehave has one of the largest assortments of carnivorous plants in Europe, and we are constantly testing new varieties for possible marketing.